The complete DualLiner Bedliner System, the most effective truck bed liner on the market. Exactly what you need to keep your Chevy Silverado 3500/3500HD bed looking as new as the day you bought it. A simple 30-minute installation will protect your truck bed from damage. This DualLiner truck bed liner was custom made for the Chevy Silverado 3500/3500HD 5 foot 9 bed pickup and 2015-2018 Chevy Silverado 3500/3500HD pickup trucks. As you know, your Chevy Silverado 3500/3500HD with a 5 foot 9 bed is built to last. Let DualLiner protect your truck and your cargo! The DualLiner Bedliner offers a completely unique 5-piece system combining custom-fit, hard dent protection panels for the bulkhead, sides and tailgate that integrate with a heavy duty ZeroSkid® Rubber Floor. The 3/8" Thick ZeroSkid® mat interlocks with the sidewalls to provide complete protection. The Dual Liner was developed to provide the highest level of scratch and dent protection available, to keep your trucks bed like new! ZeroSkid® means cargo stays put – if it doesn‘t move, it can‘t get damaged. The ZeroSkid® Rubber Floor is not your typical bed mat; it was developed with hundreds of soft rubber cleats on the underside. This allows for drainage and air flow, protecting your trucks finish and paint. DualLiner® guarantees dent protection with hard, custom-fitted sidewalls and the thick ZeroSkid® bed mat that blocks impact. You bought a Chevy Silverado 3500/3500HD for a specific reason, maybe it is the overall appearance or maybe it is the general durability, either way you want to take good care of it so it will look good and last. Your Chevy is tough – protect your truck, protect your investment - DualLiner® delivers with a Real lifetime warranty. You need the only bed liner that can stand up to the way you use your Chevy Silverado 3500/3500HD, DualLiner, The Only Bed Liner That Works®! The complete DualLiner Bedliner System, the most effective truck bed liner on the market. Just the thing you need to keep your Chevy Silverado 3500 and 3500HD bed looking as new as the day you bought it. A simple 30-minute installation will protect your bed from damage. This DualLiner truck bedliner was custom made for the Chevy Silverado 3500 and 3500HD 6 foot 6 bed pickup. As you know, your Chevy Silverado 3500 and 3500HD with a 6 foot 6 bed is built to last. Let DualLiner protect your truck and your cargo! The DualLiner Bedliner offers a completely unique 5-piece system combining custom-fit, hard dent protection panels for the bulkhead, sides and tailgate that integrate with a heavy duty ZeroSkid® Rubber Floor. The 3/8" Thick ZeroSkid® mat interlocks with the sidewalls to provide complete protection. The Dual Liner was developed to provide the highest level of scratch and dent protection available, to keep your trucks bed like new! The complete DualLiner Bedliner System, the most effective truck bed liner on the market. Just the thing you need to keep your Chevy Silverado 3500 and 3500 HD bed looking as new as the day you bought it. A simple 30-minute installation will protect your truck bed from damage. This DualLiner truck bedliner was custom made for the Chevy Silverado 3500 and 3500 HD 8foot bed pickup. As you know, your Chevy Silverado 3500 and 3500 HD with an 8 foot bed is built to last. Let DualLiner protect your truck and your cargo! The DualLiner Bedliner offers a completely unique 5-piece system combining custom-fit, hard dent protection panels for the bulkhead, sides and tailgate that integrate with a heavy duty ZeroSkid® Rubber Floor. The 3/8" Thick ZeroSkid® mat interlocks with the sidewalls to provide complete protection. The Dual Liner was developed to provide the highest level of scratch and dent protection available, to keep your trucks bed like new! The complete DualLiner Bedliner System, the best truck bed liner for your Chevy Silverado 2500HD and it'll keep your truck bed looking as new as the day you bought it. A simple 30-minute installation will protect your bed from damage for the life of your 2500HD! This DualLiner bedliner was custom made for the Chevy Silverado 2500HD WT, LT, LTZ, and High Country with Standard Cab, Extended Cab or Crew Cab and a standard 6 foot 6 inch bed. Your Chevy Silverado 2500HD with a 6 foot 6 inch bed is built to last. Let DualLiner protect your truck bed and your cargo! The DualLiner Bedliner offers a unique 5-piece system combining custom-fit, hard dent protection panels for the bulkhead, sides and tailgate that integrate with a heavy duty ZeroSkid® rubber floor bed mat. The 3/8" Thick ZeroSkid® bed mat interlocks with the sidewalls to provide complete protection. The DualLiner was developed to provide the highest level of scratch and dent protection available, to keep your truck's bed like new! Compatible with Tonneau Covers, Truck Caps and More! ZeroSkid® means cargo stays put – if it doesn‘t move, it can‘t get damaged. The ZeroSkid® Rubber Floor is not your typical bed mat; it was developed with hundreds of soft rubber cleats on the underside. This allows for drainage and air flow, protecting your trucks finish and paint. DualLiner® guarantees dent protection with hard, custom-fitted sidewalls and the thick ZeroSkid® bed mat that blocks impact. You bought a Chevy Silverado 2500 and 2500 HD for a specific reason, maybe it is the overall appearance or maybe it is the general durability, either way you want to take good care of it so it will look good and last. Your Chevy is tough – protect your truck, protect your investment - DualLiner® delivers with a Real lifetime warranty. You need the only bed liner that can stand up to the way you use your Chevy Silverado 2500HD: DualLiner, The Only Bed Liner That Works®! The complete DualLiner Bedliner System, the most effective truck bed liner on the market. Just the thing you need to keep your Chevy Silverado 2500/2500HD bed looking as new as the day you bought it. A simple 30-minute installation will protect your truck bed from damage. This DualLiner truck bedliner was custom made for the Chevy Silverado 2500/2500HD 5 foot 9 bed pickup and 2015-2018 Chevy Silverado 2500/2500HD pickup trucks. As you know, your Chevy Silverado 2500/2500HD with a 5 foot 9 bed is built to last. Let DualLiner protect your truck and your cargo! The DualLiner Bedliner offers a completely unique 5-piece system combining custom-fit, hard dent protection panels for the bulkhead, sides and tailgate that integrate with a heavy duty ZeroSkid® Rubber Floor. The 3/8" Thick ZeroSkid® mat interlocks with the sidewalls to provide complete protection. The Dual Liner was developed to provide the highest level of scratch and dent protection available, to keep your trucks bed like new! ZeroSkid® means cargo stays put – if it doesn‘t move, it can‘t get damaged. The ZeroSkid® Rubber Floor is not your typical bed mat; it was developed with hundreds of soft rubber cleats on the underside. This allows for drainage and air flow, protecting your trucks finish and paint. DualLiner® guarantees dent protection with hard, custom-fitted sidewalls and the thick ZeroSkid® bed mat that blocks impact. You bought a Chevy Silverado 2500/2500HD for a specific reason, maybe it is the overall appearance or maybe it is the general durability, either way you want to take good care of it so it will look good and last. Your Chevy is tough – protect your truck, protect your investment - DualLiner® delivers with a Real lifetime warranty. You need the only bed liner that can stand up to the way you use your Chevy Silverado 2500/2500HD, DualLiner, The Only Bed Liner That Works®! The complete DualLiner Bedliner System, the most effective truck bed liner on the market. Just the thing you need to keep your Chevy Silverado bed looking as new as the day you bought it. A simple 30-minute installation will protect your bed from damage. This DualLiner product was custom made for the Silverado with an 8 foot bed and fits 2015-2018 Chevy Silverado 2500 and 2500HD pickup trucks. As you know, your Chevy Silverado 2500 and 2500HD with an 8 foot bed is built to last. Let DualLiner protect your truck and your cargo! The DualLiner Bedliner offers a completely unique 5-piece system combining custom-fit, hard dent protection panels for the bulkhead, sides and tailgate that integrate with a heavy duty ZeroSkid® Rubber Floor. The 3/8" Thick ZeroSkid® mat interlocks with the sidewalls to provide complete protection. The Dual Liner was developed to provide the highest level of scratch and dent protection available, to keep your trucks bed like new! ZeroSkid® means cargo stays put – if it doesn‘t move, it can‘t get damaged. The ZeroSkid® Rubber Floor is not your typical bed mat; it was developed with hundreds of soft rubber cleats on the underside. This allows for drainage and air flow, protecting your trucks finish and paint. DualLiner® guarantees dent protection with hard, custom-fitted sidewalls and the thick ZeroSkid® bed mat that blocks impact. You bought a Chevy Silverado 2500 and 2500 HD for a specific reason, maybe it is the overall appearance or maybe it is the general durability, either way you want to take good care of it so it will look good and last. Your Chevy is tough – protect your truck, protect your investment - DualLiner® delivers with a Real lifetime warranty. You need the only bed liner that can stand up to the way you use your Chevy Silverado 2500 and 2500 HD, DualLiner, The Only Bed Liner That Works®! The complete DualLiner System is the best truck bed liner available for your Chevy Silverado 1500 Crew Cab, Double Cab or Standard Cab in trim models WT, LS, LT, LT Z71, LTZ, LTZ Z71 or High Country with standard box. It'll keep your 1500 truck bed looking as new as the day you bought it and a quick and easy 30-minute installation protects your bed from damage. 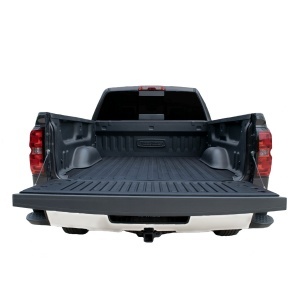 This DualLiner truck bedliner was custom designed for the 2014-2018 model year Chevrolet Silverado 1500 with 6 foot 6 bed pickup and works with 4 or 8 bed tie-downs (see options below). Your Chevrolet Silverado 1500 with a 6 foot 6 inch bed is built from tough high-strength steel and will serve you well for a long time. Let DualLiner protect your truck and your cargo! The DualLiner Bedliner offers a unique 5-piece component system, combining custom-fit hard dent protection panels for the bulkhead, sides and tailgate, integrated with a heavy duty ZeroSkid® rubber floor bed mat. The 3/8" Thick ZeroSkid® mat interlocks with the sidewalls to provide complete protection. The DualLiner was developed to provide the highest level of scratch and dent protection available, to keep your truck's bed like new! It does NOT slip around like a drop in bedliner! ZeroSkid® means cargo stays put – if it doesn‘t slip, it can‘t get damaged. The ZeroSkid® Rubber Floor is not your typical bed mat; it was developed with hundreds of soft rubber nibs on the underside. This allows for water drainage and air flow, protecting your truck's paint. DualLiner® guarantees dent protection with hard, custom-fitted sidewalls and the thick ZeroSkid® bed mat that blocks impact. You bought a Chevy Silverado 1500 Crew Cab for a specific reason, maybe it is the overall appearance or maybe it is the general durability, either way you want to take good care of it so it will look good and last. Your Chevy is tough – protect your truck, protect your investment - DualLiner® delivers with a Real lifetime warranty. You need the only bedliner that can stand up to the way you use your Chevy Silverado 1500: DualLiner, The Only Bedliner That Works®! The complete DualLiner Bedliner System, the most effective truck bed liner for your Silverado 1500 WT, LS, LT or LT Z71 Regular Cab with long 8 foot box. Just the thing to keep your truck bed looking as new as the day you bought it, with a simple 30-minute installation. This DualLiner truck bedliner was custom made for the 2014-2018 model year Silverado long box pickup truck. As you know, your Chevy Silverado 1500 with an 8 foot bed is built to last. Let DualLiner protect your truck and your cargo! The DualLiner Bedliner offers a unique 5-piece system combining custom-fit, hard dent protection panels for the bulkhead, sides and tailgate that integrate with a heavy duty ZeroSkid® Rubber Floor. The 3/8" Thick ZeroSkid® mat interlocks with the sidewalls to provide complete protection. The DualLiner was developed to provide the highest level of scratch and dent protection available, to keep your truck's bed like new! ZeroSkid® means cargo stays put – if it doesn‘t move, it can‘t get damaged. The ZeroSkid® Rubber Floor is not your typical bed mat; it was developed with hundreds of soft rubber cleats on the underside. This allows for drainage and air flow, protecting your trucks finish and paint. DualLiner® guarantees dent protection with hard, custom-fitted sidewalls and the thick ZeroSkid® bed mat that blocks impact. You bought a Chevy Silverado 1500 for a specific reason, maybe it is the overall appearance or maybe it is the general durability, either way you want to take good care of it so it will look good and last. Your Chevy is tough – protect your truck, protect your investment - DualLiner® delivers with a Real lifetime warranty. You need the only bed liner that can stand up to the way you use your Chevy Silverado 1500: DualLiner, The Only Bedliner That Works®!